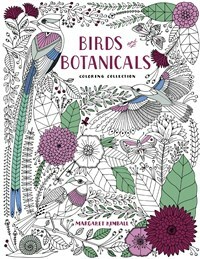 Each of the 39 hand-drawn illustrations in Birds & Botanicals captures the details of the natural world, from birds and animals to plants and flowers. The intricate designs provide hours of relaxation. Perforated paper allows for easy coloring and removal for hanging. Margaret Kimball is an illustrator and writer who loves to draw things from nature, animals, houses and buildings. She is a former assistant professor of illustration at Lesley University in Boston and creative director at the boutique consultancy group Takeout.